AND THE QUESTION IS... DID HE OR DID HE NOT SEE HIS SHADOW | A.B.E. Remodeling, INC.
Hello.... happy groundhogs day to all. Can you believe that we depend on the shadow of a rodent to determine the weather forecast. Only in America. So did he or did he not see his shadow-that old Punxsutawney Phil? A crowd gathered at Gobbler's Knob early this morning, awaiting the emergence of the groundhog named Punxsutawney Phil. After a tap of a cane on Phil's tree-trunk cage, his door was opened, and the animal emerged. He was held aloft to cheers and applause. Phil did not respond, other than to blink. Placed on top of the trunk, he attempted to flee before his actions were closely analyzed. Interpreting Phil's behavior, the Groundhog Club emcee proclaimed, "There is no shadow to be cast! An early spring is my forecast!" He added, "Take your jackets off, you're not going to need them!" Few in the crowd followed that advice; the temperature this morning in Punxsutawney, Pa., was reported at 22 degrees. 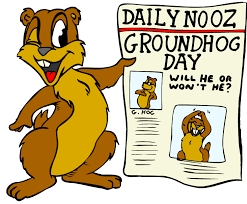 The findings were independently verified by a groundhog in Canada, whereShubenacadie Sam also saw no shadow. Of course, other groundhogs are available. There's always Staten Island Chuck in New York and General Beau Lee in Georgia - both of whom concur with Phil. That's enough to make up what some would call a repetition of groundhogs (which is evidently the collective noun for the animals, although that seems a bit too cute). Enjoy your groundhog day.... it's like spring outside.